Recap: Paul Maholm, who shares a birthday with Pat, pitched a great 7 2/3 it innings, at one point retiring 15 batters in a row. Jim Tracy made a smart move by taking him out at the first sign of trouble, replacing him with the reliable Shawn Chacon who finished the 8th. Matt Capps ended with a 1-2-3 ninth. 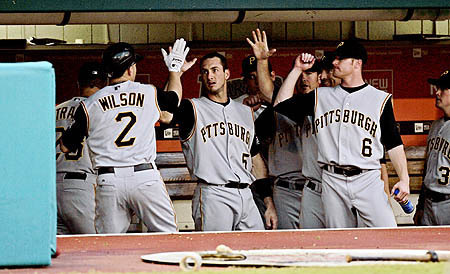 Jack Wilson hit the winning homerun in the 4th in a game that lasted only 2 hours and 15 minutes. All You Need to Know: Counting last night, Malholm has put up a respectable 3.72 ERA over his last 7 games. Considering the league average is 4.24, Maholm has shown that he belongs in the rotation. You're next Duke. Recap: Tony Graffanino hit a 2 run shot and Johnny Estrada smacked a grand slam in the same inning in what ended up being a 9 run 6th. All You Need to Know: I was desperately looking for the standings of the sausage race, but could not find anything. If anyone knows where they keep the results, please let me know. Recap: The Cubs won their 5th straight game, moving to within 2 games of .500. Cliff Floyd hit a two-run homer and Alfonso Soriano continued his strong play with a 2 for 5 night. All You Need to Know: Actually it's nothing you need to know, but now that it seems like the Cubs could make this a race, who would you rather have win this division, the Cubs or the Brewers? I find reasons to dislike both options, but I find myself rooting for the Cubs only so we can watch another self-destruction in the playoffs. Recap: The Cards pull a reversal from last night, with Brenden Ryan hitting a game winning 2-run homerun in the top of the 11th inning. Oliver Perez (6.1 IP,5 H, 2 ER) pitched decently, which is the first time in his career he found a happy medium between lights out and horrible. Cardinals Stat of the Day: While the Pirates have drawn the third lowest walk total in baseball at 215, the Cardinals are even worse at 209. In an act of goodwill, the Pirates have sent them Jeff Manto to help them iomprove plate patience. Below is a student in the hitting school of Jeff Manto, which has produced back-to-back-to-back A.A.U. cellar dwellers. Recap: Basically, the Phillies got lots of hits, and the Reds didn't. I am going to leave this here for all Reds games until they win. All You Need to Know: The Reds do have some interesting trade bait going into July with Ken Griffey Jr. and Adam Dunn both reportedly available. 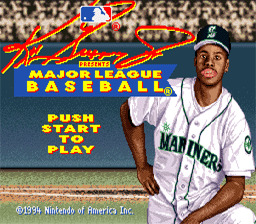 On top of this, Griffey apparently wants to go back to Seattle.